At some point, when I was much younger, I stopped ordering chicken in restaurants. Chicken, the younger, sillier me rationalized, was something I cooked at home, so why order it in restaurants. Things like duck, lamb, veal, scallops, turbot… not only was I not buying these things in the local Food Emporium, even if I had, I wouldn’t have known how to cook them. So, when I had the chance to dine out in fancy restaurants–and even not that fancy restaurants–I would try to order anything but chicken. It reached a point where I wouldn’t even really read the chicken items on menus. I’d just skip over them looking for more exotic meats. Of course, I was young and stupid and fortunately, I got over this ridiculous eccentricity pretty quickly. Because sometimes, there’s nothing better than a really well-roasted chicken or a perfectly cooked oyako-don. In fact, some of the world’s best restaurants’ dishes are chicken dishes. Like Auberge Bressane’s coq au vin or Le Cinq’s chicken and lobster en cocotte. One of the most amazing culinary experiences I have ever enjoyed was at Alain Ducasse in Paris, which S and I went to during our honeymoon. The one and only time we went there, we both ordered the Winter Truffle Menu. 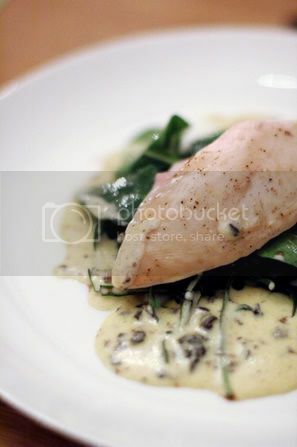 The main course was a wonderfully tender chicken breast, with a gorgeous white sauce. This was then smothered with a mountain of paper thin shavings of the most incredibly aromatic white truffle. Chicken had never been as sensuous. S and I made a quick, casual dinner for a couple of friends this past Thursday. For starters, S whipped up some super-delicious lamb ravioli tossed in a sage-butter sauce. (The lamb was actually the leftovers from our 7-hour lamb roast.) For our main, I slow-cooked a couple of chickens “en cocotte”. I cooked them with leeks, carrots and garlic in S’s awesome 40cm Staub cocotte at 120ºC for 75 minutes. To go with the chicken, I tossed some rocket and spinach with some olive oil and raspberry flavored vinegar. S helped me carve the chicken and plate it neatly over the greens. Over this, I poured a truffle-butter sauce that I made. I’m a big, big fan of white sauces. S complains that I love butter much too much. And I guess it’s true. To me, nothing beats a velvety smooth, well-made white sauce. This sauce was also a cinch to make, calling for only flour, butter, thickened cream, chicken stock, and my favourite magic ingredient, Tetsuya’s truffle salsa. The dish came together beautifully and is, I think, a fitting if not economical homage to that magic chicken dish S and I ate on our honeymoon. I used to have similar tastes when ordering out, CH. I would avoid chicken and also skip over the menu items. I think it is because there are so many mediocre preparations of chicken out there that we’d forgotten the amazing results to be had when it has been prepared with care. Like the much-maligned vanilla, chicken was regarded as a synonym for bland. Luckily, like you, I’ve gotten over such silliness. I started laughing when I read about your chicken-avoidance at restaurants. I’m guilty of the same thing! Except I’m still stuck in the rut. I think it’s more a fear of chicken breast. And the accompanying dryness and tacky texture *shudder* Your chicken looks wonderful though. And exquisitely captured as always. Hi C.H. – you’re really tempting me to buy a Staub cocotte now! That chicken looks absolutely divine. You know, I never developed the chicken-as-inferior-meat syndrome because I spent ten of my gastronomically formative years as a vegetarian. When I started eating meat again in my early 20s, it was as strange and exciting as everything else! But this looks a cut above your average chicken – I’m going to make it as soon as I can track down some truffle sauce. mmm this sounds (and looks) lovely. Do you use the butter that comes in foil wrapped blocks or the stuff that comes in plastic tubs? tara: Actually, I love vanilla too. Vanilla ice cream has long been my fave flavour. In fact, S and I have been discussing making 2 batches of it soon, using two different kinds of vanilla beans that we have. We’ll keep you, parden the pun, posted. Augustus: I agree. Most people kill chicken breast. Try Thomas Keller’s roast chicken recipe from Bouchon. The chicken breast stays amazingly moist and the skin crispy and delightful. Melissa: I was a vegetarian for about 2 years (because of a girl of course) when I was young. Silly me. You should be able to find the Truffle Salsa at top gourmet stores, but if you can’t, drop me an email. You should also be able to find it at gourmet food stores. Gwenda: Hiya. So, when are you going to start posting again? fanny: It’s a wonderful but also painful experience when you start eating meat again after a stint of vegetarianism. I started again after my vegan girlfriend (this is way back in college) and I broke up. In my misery and anger, I decided to eat something I would never have been able to while dating her, and ordered up a big plate of corned beef hash at a local diner. Boy, was it good. Boy, did I feel ill afterwards. It took me a couple more meals for my body to get used to red meat again. I bet there’s a good chance you’ll find Tet’s truffle salsa at David Jones’ food hall. wow, i am new to your blog and when reading this post was first like ‘ah, yes, i to have been guilty of passing on the chicken’ at least when i am paying… i have a thing with ordering a cheaper item when i know someone else is picking up the bill… catholic guilt, maybe i don’t know. but reading on, i simply got hungrier and hungrier. while i am a baker at heart, i cook nearly every night and try to experiment in the savory kitchen. you are an inspiration! Yesterday night had few friends coming for dinner so I took your recipe as inspiration. After going around town for a while, I was so happy when finally I found the truffle salsa. I did the presentation slightly different which came out really good! They all love it! Thanks!